Pra Kru WiMonKuNaGon or Luang Poo Suk GeSaRoh was borned at Moo Bahn Pahk Klorng MaKhamTow, Ampher WatSing, Jangwat ChaaiNaht. His father was named Nuam and mother was Torng Dee. He was borned on 14th October BE2390 during the 4th King Regime. When Luang Poo Suk was 10 years old, his mother sent him to GrungTep(Bangkok) to be raised by his uncle. Luang Poo Suk remained in GrungTep until he got married to a very beautiful woman who bored him a son. When Luang Poo Suk reached the age for ordain, he went to Wat PohTorngLahng and was ordained as a monk. His preceptor was Pra UPaChaYaCui JanNaTaSiRi. His ordain's name was called GeSaRoh. 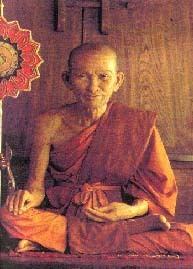 Luang Poo Suk studied Dhamma and Sammahdti at Wat PohTorngLahng until he was ready to go Tudung. He met many teachers during his Tudung and he learned Wichah(magic) from them. One of the teachers who taught him Wichah was Pra Ah Jahn ThumWuaDaeng. Pra Ah Jahn ThumWuaDaeng was also the teacher who has ever taught Luang Por Ngern Wat Bahng Klahn Jangwat PiJit, who was famous for his Pra Pidtah Pim Khee Dtah. Luang Poo Suk went back to his hometown after many years od Tudung. His parents who has waited many years for his return, asked Luang Poo Suk to remain at Pahk Klorng MaKhamTow. Luang Poo Suk obeyed his parents and stayed at Pahk Klorng MaKhamTow until he became the abbot of the village's temple; Wat Pahk Klorng MaKhamTow. Luang Poo Suk rebuilt Wat Pahk Klorng MaKhamTow, from a small village temple to a large and beautiful temple. Luang Poo Suk has many disciples, both ordained and lay disciples. One of his lay disciple who was very close to Luang Poo Suk was GromLuangChumPron KhetUDomSak who was the son of the 4th King. Luang Poo Suk taught him everything he knew about Dhamma and Wichah. Luang Poo Suk was very famous for his Wichah. One of his abilties was that he could change the sizes and shapes of an object. There was one day, an large group of merchants, stopped by at Wat Pahk Klorng MaKhamTow to rest. During those days, merchants used elephants as a mean of transport as well as to carry their goods. While the merchants wanted to cook their meals at the temple, but realised that they did not bring along enough meat. Some of the villagers, jokingly asked them why don't they use their rifles to shoot at the pigeons at the temple, so that they could have pigeon meat for their dinner. One of the merchants took the joke seriously, and started to fire his rifle at the pigeon, but the rfile failed to fire. The villagers stopped him, and told him that Luang Poo Suk prohibit anyone to kill living things in the temple. That merchant refused to listen and seeing that the rifle failed to fire, he raised his cross-bow and fire the arrow at the pigeon. The arrow flied off, but dropped at a short distance, without hitting the pigeon. This merchant became very angry and started to shout: "The abbot of this temple has what great power?" Luang Poo Suk as if he could hear the merchant from his KuTi(hut) far away, he came out from his kuti with hands carrying an empty coconut husk. Luang Poo Suk went to the gazing field. He chanted a certain kathah on to the coconut husk, and then point towards the direction where the merchants' elephants were gazing. Miraculously, the elephants were reduced into houseflies and Luang Poo Suk covered the houseflies with the empty coconut husk. The next morning, when the merchants were to set off their journey, they could not find their elephants. They quckly went to Luang Poo Suk and told him that their elephants have been stolen. Luang Poo Suk preached them precept of not killing of living beings: "If you kill a living being, the living being will feel pain. This is similar to the pain of losing your elephants." Luang Poo Suk taught them the Dhamma and asked them to practise good deeds instead of bad deeds. The merchant then realised that it was Luang Poo Suk who was behind the strange happenings the previous day. Luang Poo Suk led them out from his Kuti and went to the gazing field. Luang Poo Suk chanted a kathah and removed the coconut husk and the houseflies turned into elephant one more time. This ability to change objects into different sizes and shapes was one of Luang Poo Suk Wichah. He has never taught any person this Wichah, except GromLuangChumPron, his favourite lay disciple and GromLuangChumPron has never taught anyone until he passed away on the same year as Luang Poo Suk. Luang Poo Suk passed away on 21st January BE2466 at the age of 76.